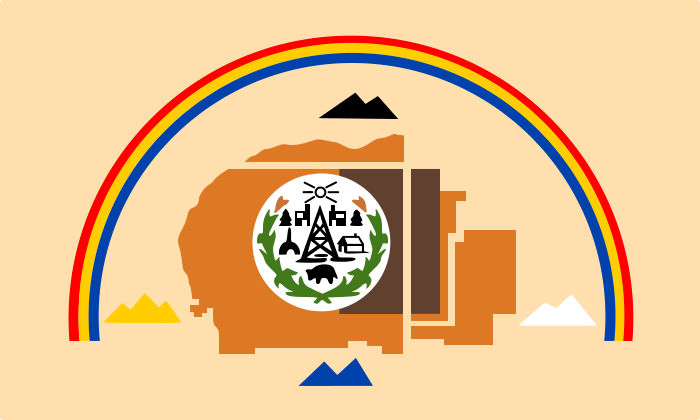 The flag of the Navajo people displays their belief in the words, “Walk in Beauty.” Seen in the flag is the integration of spiritual life through the four holy mountains and the rainbow; there is an integration of life’s work and joys seen in the medallion. The boundaries of the Navajo Nation are within the spiritual boundaries of the four holy mountains. WHEN I WORKED AT THE Navajo boarding high school in New Mexico back in the late 1970s, I noticed that there was an integration of life among the Navajo people. They do not separate life into unrelated sections. The integrated Navajo life is an undivided spirituality into their daily life, in their family, and in communal relationships. When the wind ceases to blow inside us, we become speechless. Then we die. In the skin at the tips of our fingers, we can see the trail of that life-giving. Each person has a wind that exists within, which provides the means for breathing, moving, thinking, and talking. The Christian religion in the United States, in my estimation, has lost that deep sense of integration with the created order. The dissociation of death with life and vice versa, for example, is now the domain of commercial entities. By putting the elderly into storage, separating them from the young and the young from the elderly, an integrated family life is lost. Kicked out of us by the dissociation with the created people often no longer experience the full depth and meaning of the Holy Wind—the Spirit of God. God did not make death, and he does not delight in the death of the living. For he created all things so that they might exist; the generative forces of the world are wholesome, and there is no destructive poison in them, and the dominion of Hades is not on earth. For righteousness is immortal. God created us for incorruption, and made us in the image of his own eternity, but through the devil’s envy death entered the world, and those who belong to his company experience it. God does not willingly afflict us, nor does God wish us to live afflicted lives.Jeremiahreminds humanity, in his Book of Lamentations, of its own responsibilities to protect life. For the Lord will not reject forever. Although he causes grief, he will have compassion according to the abundance of his steadfast love; for he does not willingly afflict or grieve anyone. When Jairus, the leader of the synagogue, (as reported in the Gospel according to Mark) seeks Jesus to heal his daughter, he believes in life and has hope. In Jesus, he sees both life and hope. While the mourners at Jairus’ home see only death, end of life, Jesus brings hope and life into the house. Was it a miracle or did Jesus understand the girl’s distress calming her mind bringing her out of a coma? It does not matter; what matters is that Jesus brought life to the mourning family, the distraught father, and the critically ill girl. Actually, Jesus, wherever he went to heal, feed, or teach, brought peace to the people. It is a peace of mind encapsulated in the words, “Walk in beauty.” The crowd of mourners around Jairus’ home has no hope.Jesus tells the hopeless to leave, he takes peace and hope with him, and we can imagine his gentle voice telling the comatose child to rise, to get up, enjoy life. Certainly, death is a reality. Everyone will experience it. Every family loses members to illness, accident, natural catastrophe, and recently to distant wars. If God does not bring death, if Jesus raises people from the dead, and if God does not willingly afflict us, why is that we suffer such grief and look forward to our own demise with fear? The promise of the Scriptures is not eternal physical life. Human beings are organisms like all other living organisms on the planet. Unless you are a redwood or Sequoia tree in California, or a giant tortoise on the Galapagos Islands, you will not likely to live much beyond one-hundred years. The Scriptures, in fact, remind us that we can expect to live to seventy or, if we are fortunate, to eighty. Death is a reality for us. In my hospice experience, I saw it in its sometimes-painful form and sometimes as a thief in the night. Nevertheless, life continues. God did not invent death. God has given us a living spirit that is beyond the mortal life we have been given. The spirit lives in us and in those who have gone before us. In the parlance of today, we could say that the spirit lives on in the gene pool we have inherited and bequeath to our progeny. However, it seems to those who are faithful and believe that God has breathed life into Adam also has breathed his wind into us are more than molecules, genes, and chromosomes, we the living images of the one who created the world. Wisdom of Solomon 1:13-15; 2:23-24, New Revised Version, The Holy Bible, National Council of Churches. Lamentations 3:21-24, New Revised Version, The Holy Bible, National Council of Churches. Lamentations 3:31-33, New Revised Version, The Holy Bible, National Council of Churches. The Book of Common Prayer, The Episcopal Church of theUnited States, 1976. Wisdom of Solomon, 3:1-6, the New Revised Version, The Holy Bible, National Council of Churches. Have you read this? : “Beauty is before me, and/Beauty behind me,/ above me and below me/ hovers the beautiful./ I am surrounded by it, / I am immersed in ti., / In my youth, I am aware of it,/ and, in old age,/I shall walk quiety the beautful trail./ In beauty it is begun./ In beauty, it is ended. From the Navajo Immans of North America.